Fine Fettle Feed Black Tac should be used to maintain health on the heels and frog. It helps stop the hoof wall cracking and powers up resilience. It is an excellent dressing for cuts, scrapes, and scuffs, while actively protecting in muddy conditions from mud fever bacteria. 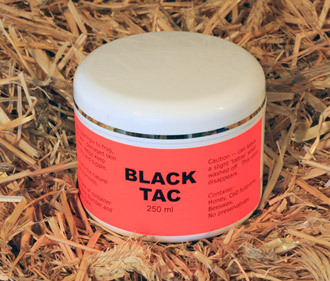 Black Tac forms this protective barrier while keeping the area supple and dry. Please Note: Black Tac can leave a slight ‘tattoo’ when washed off because of the fine charcoal used, but this fades rapidly and soon disappears. There are currently no questions for Fine Fettle Feed Black Tac for Horses - be the first to ask one!